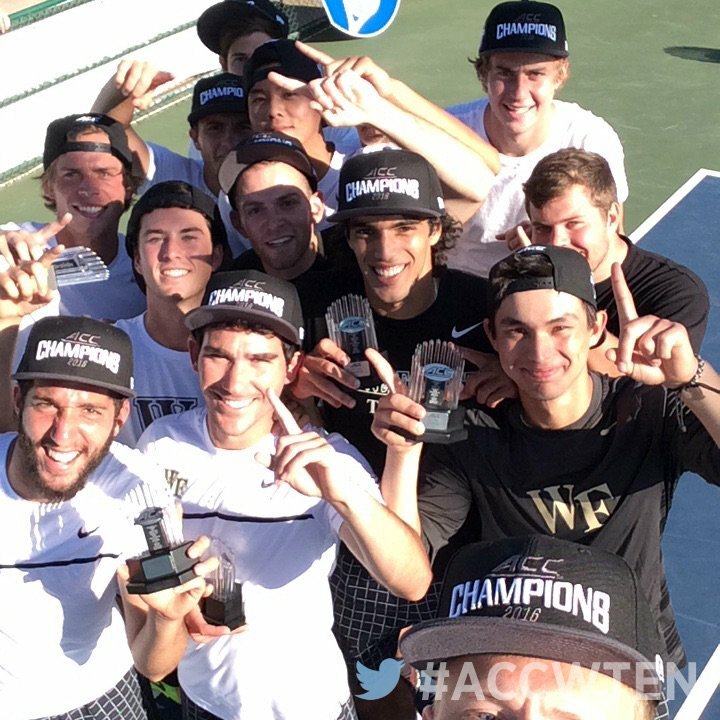 Wake Forest University’s men’s tennis team broke the University of Virginia’s 9 year run as ACC champions and claimed their first ACC championship yesterday in Cary, NC. I was privileged to be at the tournament to witness the historic accomplishment. 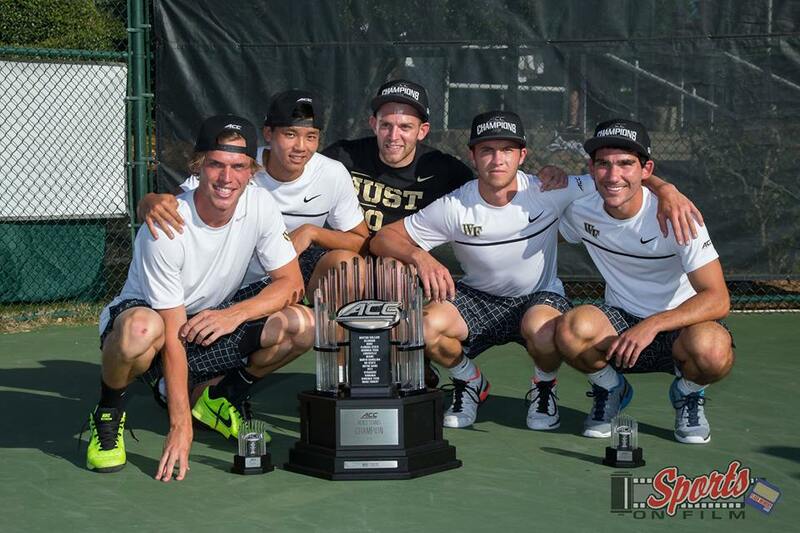 It was the culmination of many years of hard work by a large number of people and proved the old saw that “there is no ‘I’ in team.” Every person associated with the men’s tennis program contributed to this victory. 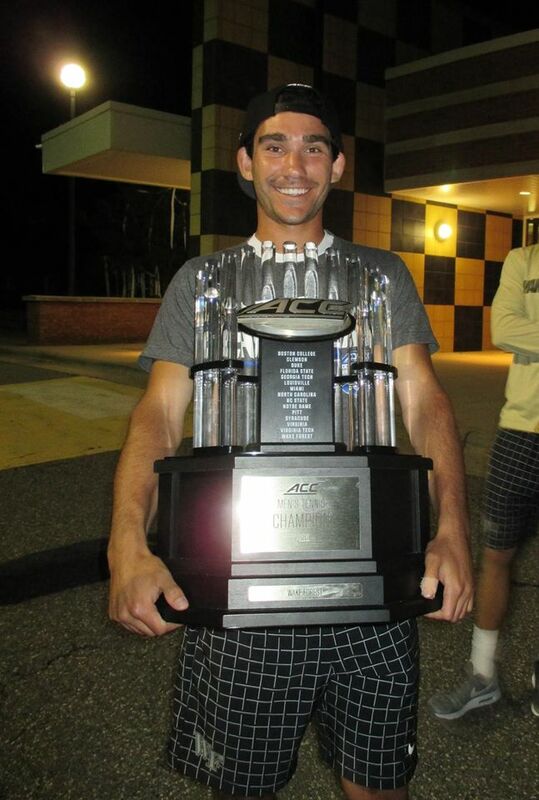 First semester Freshman Dennis Uspensky was named the ACC Tournament Most Valuable Player, and rightfully so. 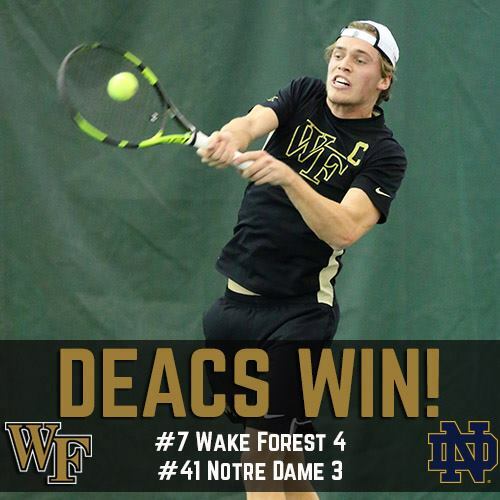 Not only did he clinch the deciding match in dramatic fashion, coming back from a break down in the third set to win 6-7, 7-6, 7-6, but he also clinched the deciding point in the semi-final match against Virginia Tech, and won in dominating fashion against Notre Dame in the quarterfinal match which Wake narrowly won 4-3. 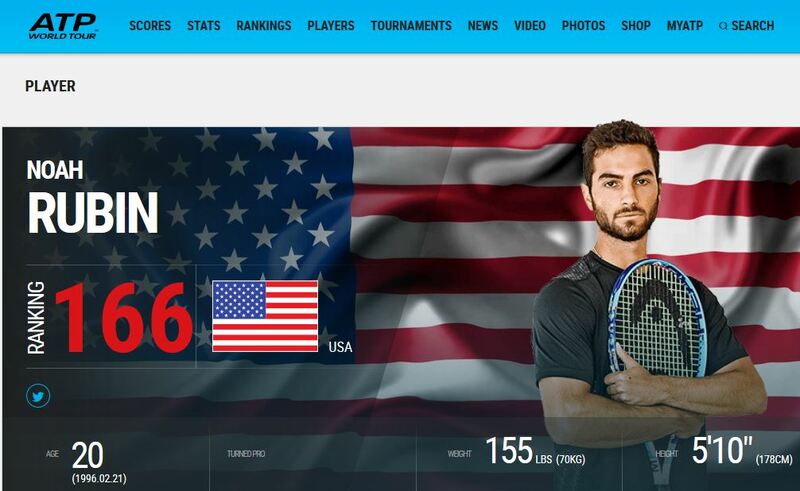 Oh, and he also played and won in doubles. Sophomore Skander Mansouri bears a heavy load playing #1 singles and doubles. In the ACC that means you play a quality opponent every match. 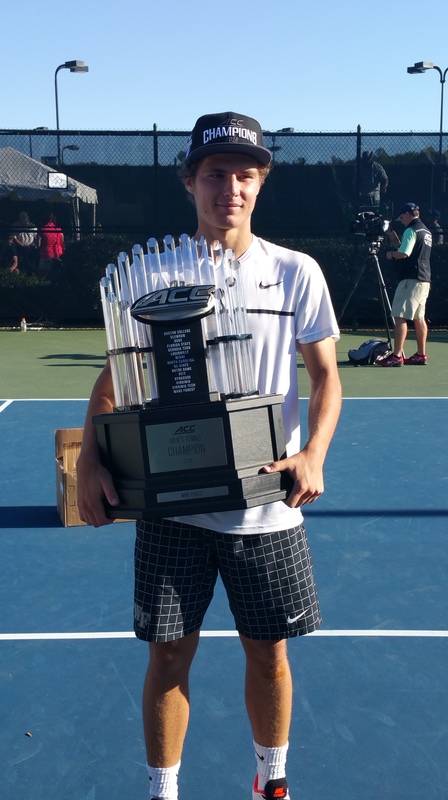 Skander had already played and lost to defending NCAA Singles Champion Ryan Shane twice this year, but the third time was a charm as he won in dominating fashion. He also teamed with fellow Sophomore Christian Seraphim in doubles to defeat the #2 team in the country to help clinch the doubles point. 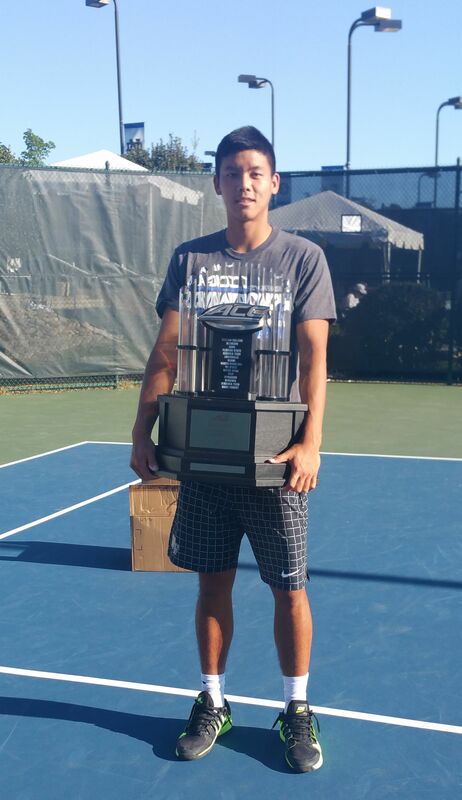 In addition to teaming with Mansouri to win in doubles, Seraphim came back from not serving out his match against Notre Dame in the quarters, and two previous third set losses to Virginia’s #5 player, and a break in the third set in his finals match, to tie the match at 3-all, and allow Uspensky the opportunity to win his decisive court. 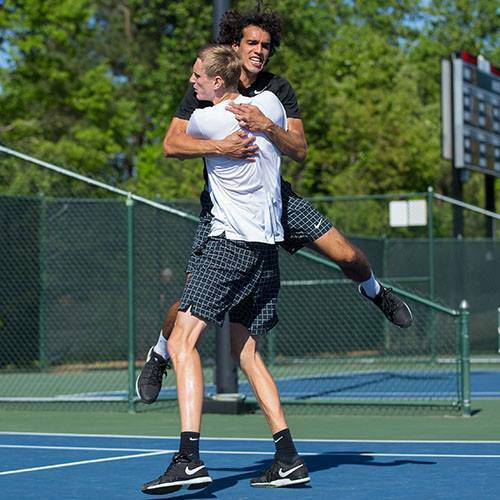 Senior Romain Bogaerts won his doubles court against Virginia to help Wake Forest take that extremely important point, but more notably came back from 2-5 down in a third set tie-breaker against Notre Dame to clinch that match. 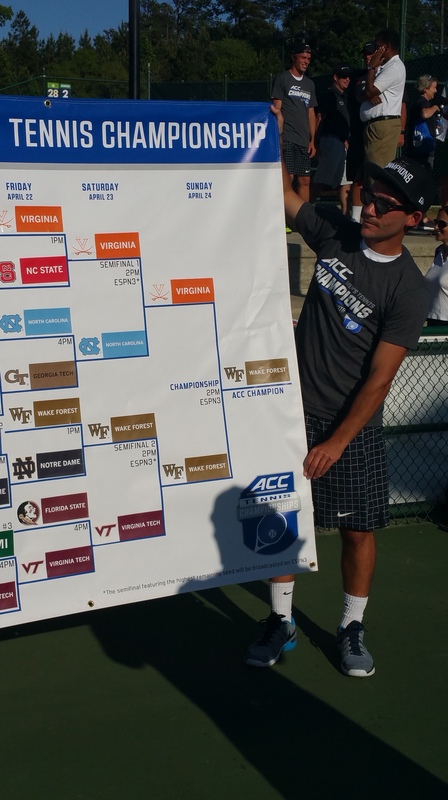 Without that win, Wake Forest would not have even been playing in the ACC tournament SEMI-final. Senior Jon Ho contributed a vital doubles win against Notre Dame, and was in position to secure the semi-final match against Virginia Tech, up 4-1 in the third set when Uspensky clinched the deciding point. 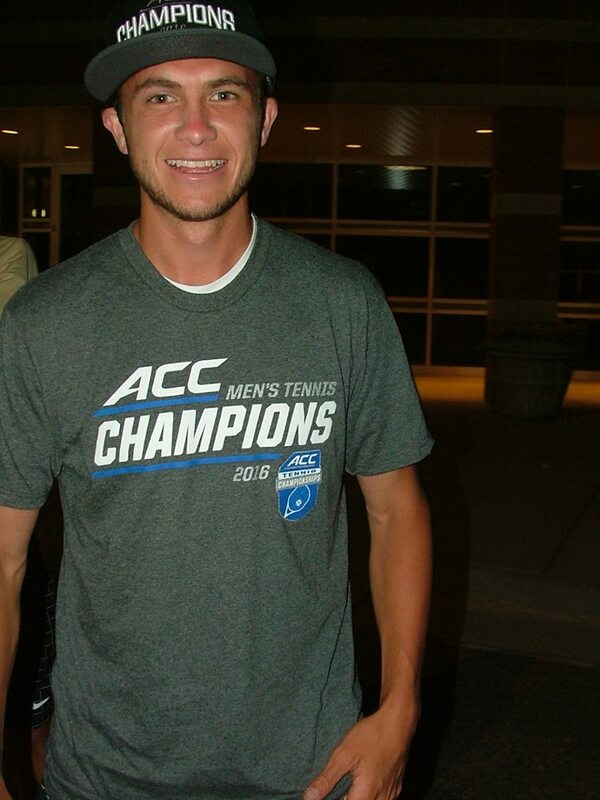 The VT match was possibly Ho’s best match of the year, and so I expect big things from him in the NCAA tourney. 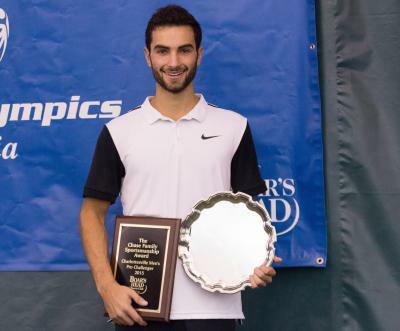 Freshman Petros Chrysochos was first off in singles in the semi-final against Virginia Tech giving the team needed momentum, and teamed with Ho to clinch the doubles point against Notre Dame. 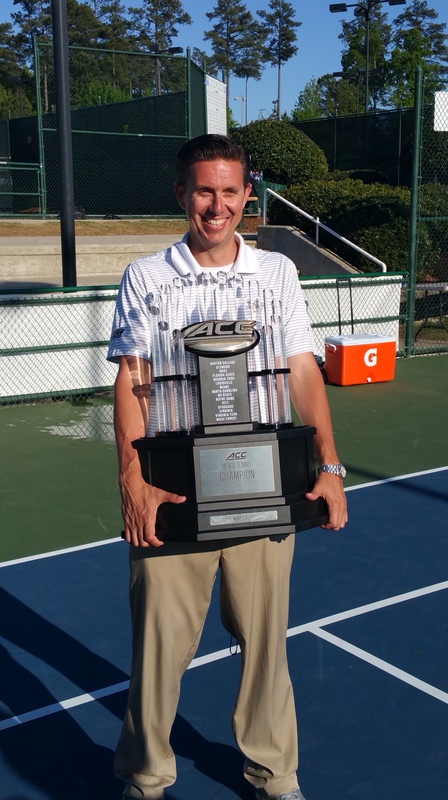 Probably not the tournament that he would have wanted for himself, but he had many big wins for the team this year and he doesn’t love the ACC Championship trophy any less. Senior Captain Anthony Delcore is the team’s official “hype man,” leading the squad in its pre-match ritual. 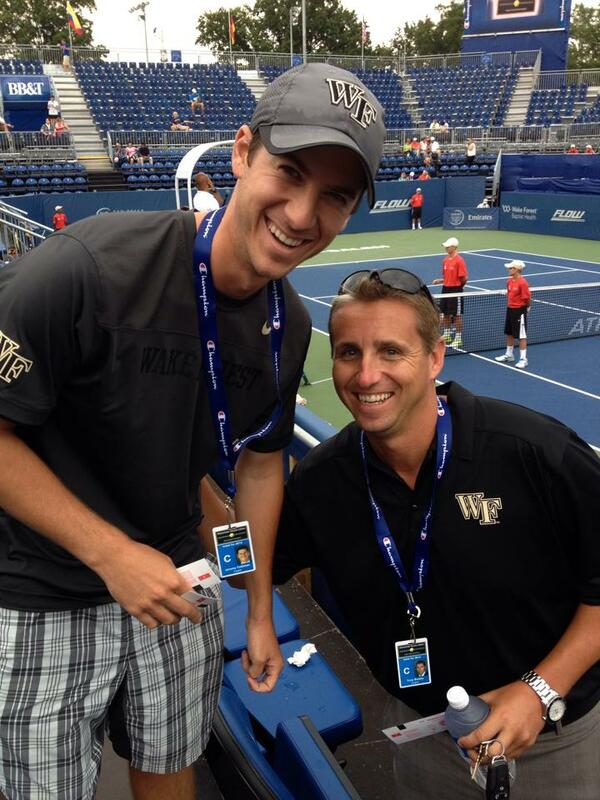 Senior Sam Bloom is Wake Forest’s secret weapon – a fourth coach, counselor, and booster, tirelessly working the courts during matches. He is also largely responsible for ensuring that everyone has transportation to practice everyday, which is a bit like herding cats I understand. As the #7 and #8 singles players, Max Kan (front right below) and Keivon Tabrizi (back middle) have to practice and prepare every day as if they could step into the starting line-up at any moment. And when they don’t get the call to play they become vital supporters of their teammates. Eric Rutledge (left center, backward hat) and Alan Gadjiev (back right) are both redshirting this season, which means alot of work and not much glory, but as they push themselves to improve they also push the team forward. 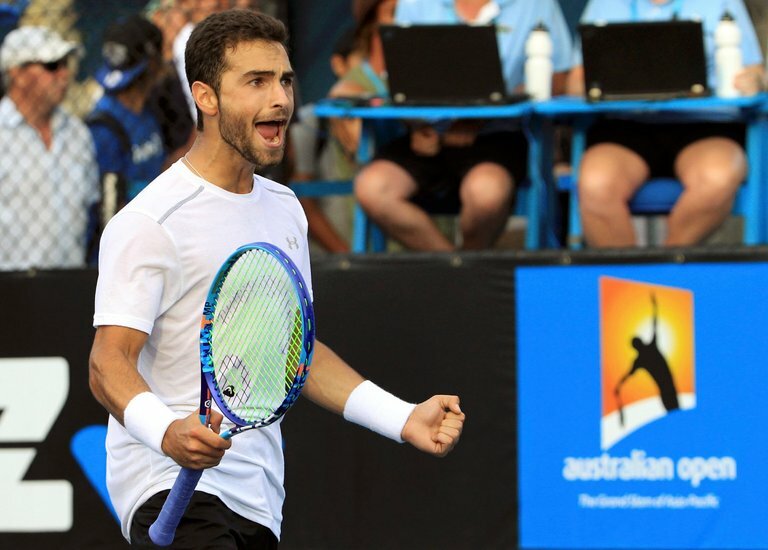 And Gadjiev has the oddest collection of one-liners you will ever hear coming from the stands in a tennis match. The team has an amazing coaching and support staff who work incredibly hard to help the players realize their potential. 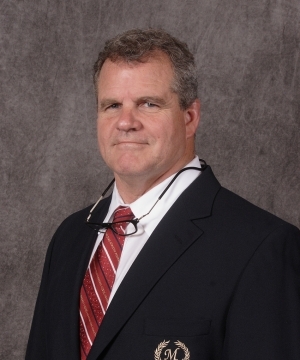 This, of course, begins with Head Coach Tony Bresky, who brought to Wake Forest an attitude that anything less than championships would not do. Assistant Coach Jeremy Feldman works as hard as anyone I know. 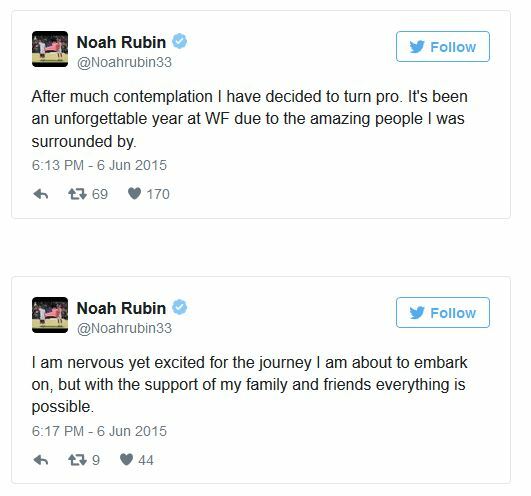 Whatever program gets him as a head coach some day will be very fortunate. The same is true of Volunteer Assistant Coach Alex Emery, who will be moving onto an assistant coaching position somewhere sooner rather than later. 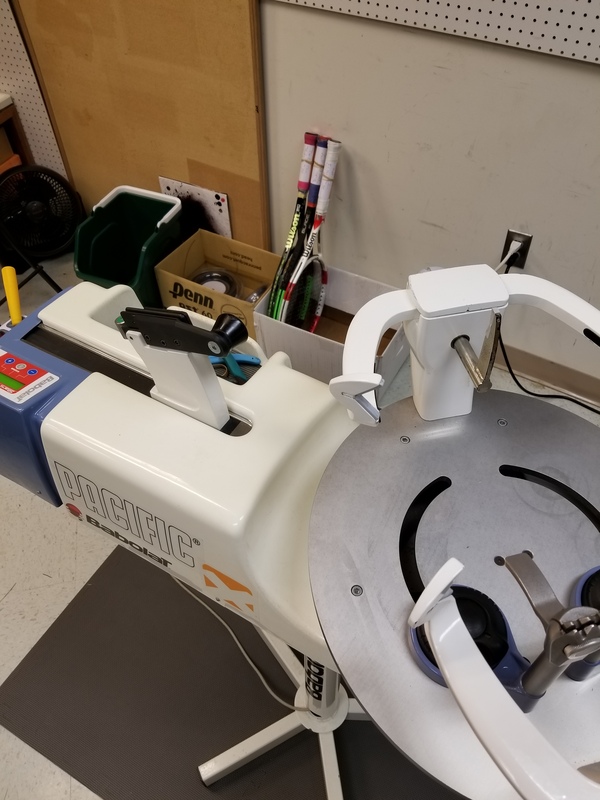 Assistant Athletic Trainer Chris Ina is responsible for keeping the guys in good health, which is none too easy given the increasing rigors of men’s tennis. Ethan Reeve, the team’s strength and conditioning coach, breaks them down and builds them up stronger. 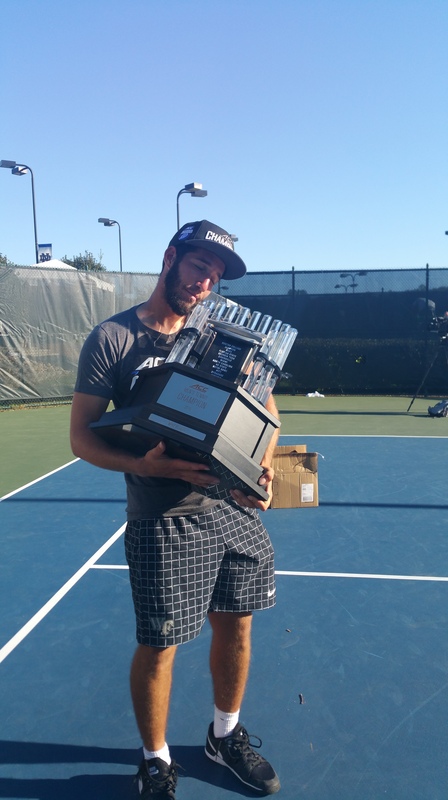 The ability of Dennis Uspensky (to take just one example) to play a three tie-break match and play as well at the end as at the beginning is a tribute to Reeve’s and Ina’s hard work. 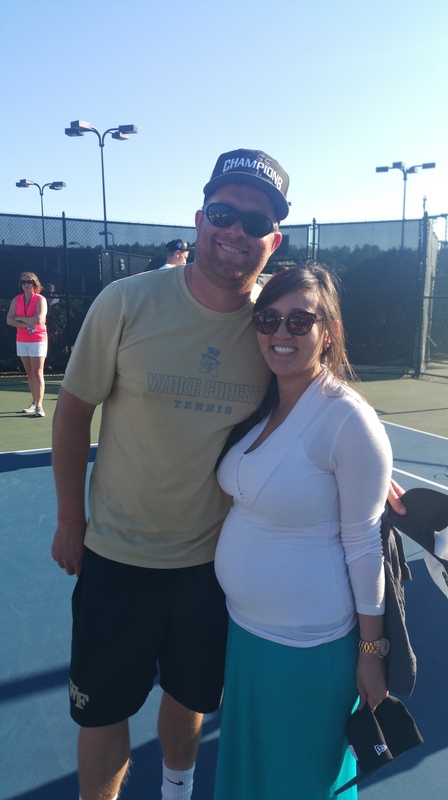 Jordan Hawks is director of operations for the program, and runs the tournaments at Wake Forest which provide key opportunities for our players to compete and also brings crucial exposure to the tennis program (shown here with his wife Dawn). Every last person counts. Included in the picture below, at center, is Brendan “Gramps” Henry, who due to injuries was never really able to compete for Wake Forest so instead brought always needed maturity and wisdom to the team (hence the nickname). I am so happy for everyone named above who has put so much into this season. And also the many people who are unnamed here who helped make this program what it is. You know who you are! 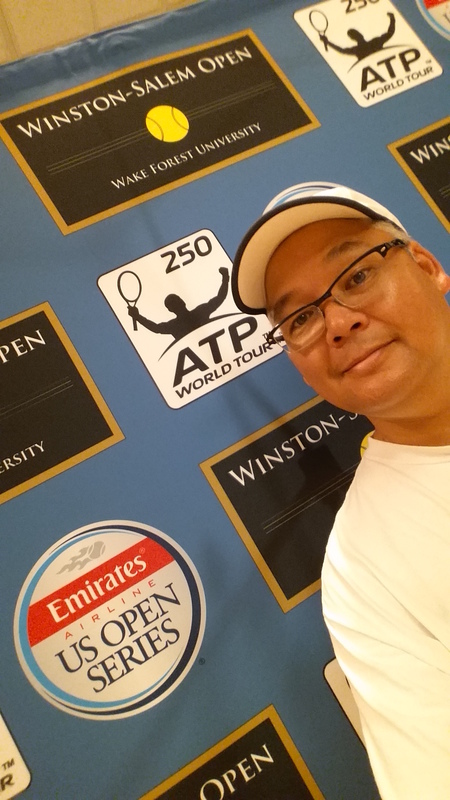 It seems like just yesterday I was neck deep in rackets at the combined ATP World Tour and WTA Tour Citi Open in Washington, DC (more on that later). 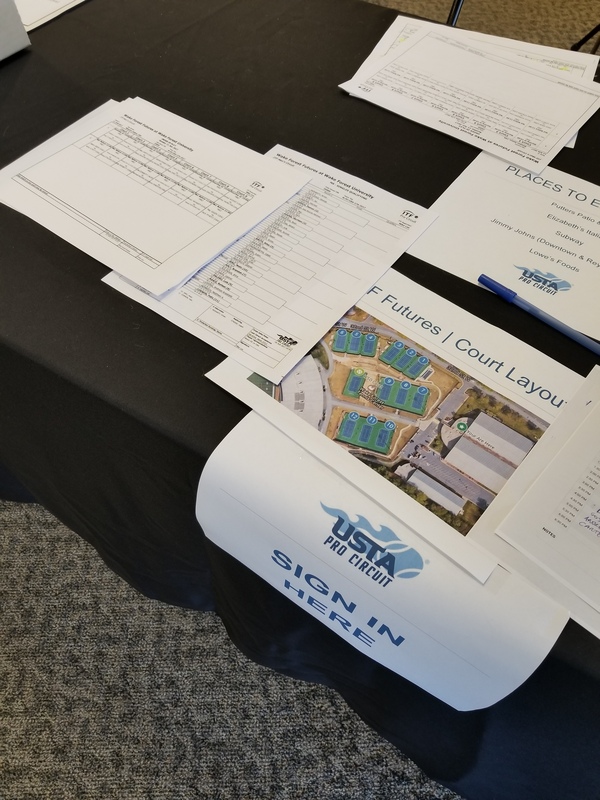 But yesterday I was at the Bridger Fieldhouse at the Wake Forest University sports complex setting up to string the ATP World Tour Winston-Salem Open. 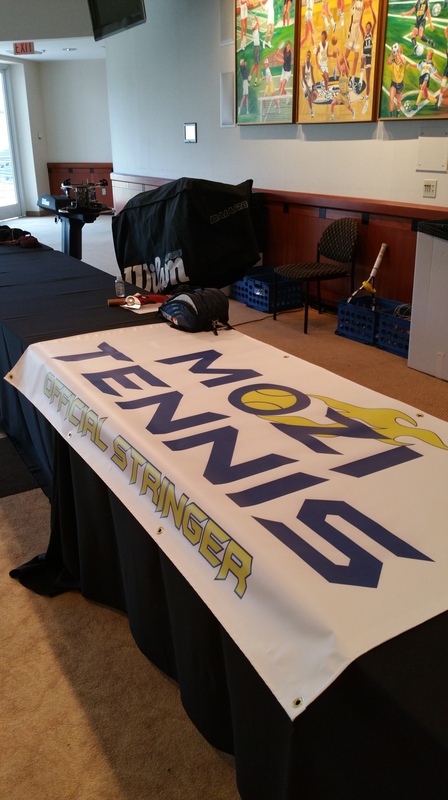 As at the Citi Open, I will be on the MOZI Tennis stringing team, headed by Dustin Tankersley. Dustin and I will be joined this year by my son Paul, which is always a great experience for me, and my wife Sandy will help with the front of the house. 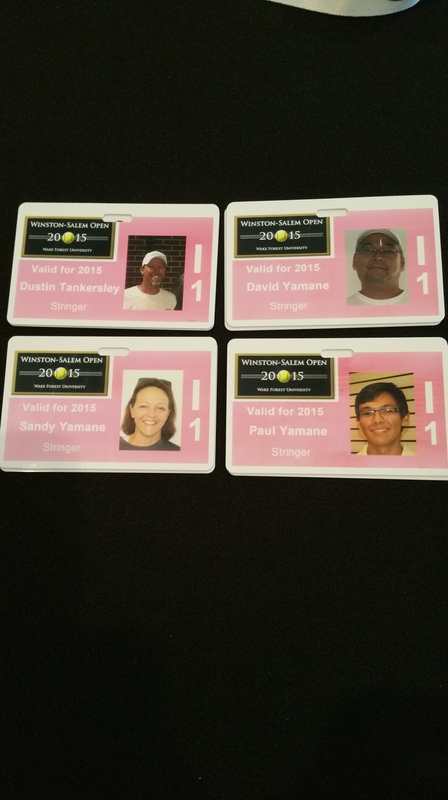 A Yamane family affair! Beginning this morning, I am on site here, and looking forward to an exciting 10 days stringing at my home town tournament. It is a treat to string a professional event and sleep in your own bed. NOTE TO REGULAR CUSTOMERS: We are still available to string. If we can help you, please be in touch.